4 7/8 x 29 1/2 x 29 1/2 in. 4 3/4 x 8 5/8 x 2 3/8 in. 5 7/8 x 8 ½ in. Betty Cuningham Gallery is pleased to announce an exhibition of works by Alison Wilding. A prominent British sculptor of international recognition, this is the first showing of Wilding’s works in the United States since 1998. The exhibition will feature major sculptural installations and works on paper. The sculptures range in scale, from the half ton weight of Largo, (2002) to the few ounces of Wolf (Captive), (2002) and from the ten foot width of Terrestrial, (2003) to the four inches of Graft II, (1994). These juxtapositions compel investigation, leading to feelings of monumental concept and concealed inner meanings. In these works, Wildings combines traditional sculptural materials such as alabaster and copper with PVC, paper and silk to create contrasts, highlighting the intangible and linking what is modern to the classical. The abstract elements born of these combined materials yield sculptures that speak on an emotional level to the viewer. And while the subject is investigated through abstraction, Wilding will make explicit references to organic form; but what remains primary of the sculpture is the functioning metaphor broad in its diversity of direction. The range between inherent literalness and ambiguity of the cast structure and its contents forms the only boundary for Wilding’s investigative curiosity. 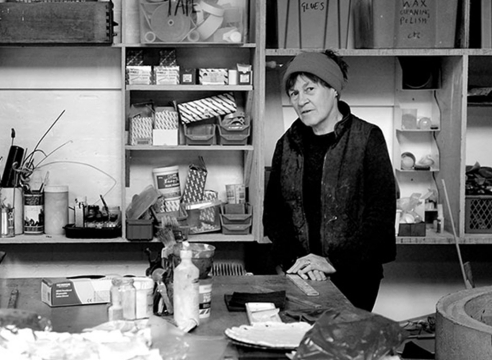 Alison Wilding has shown extensively throughout the United Kingdom, with a retrospective, Alison Wilding: Immersion – 10 Years of Work, in 1991 at the Tate Gallery, Liverpool. She was the recipient for the Henry Moore Fellowship for The British School at Rome in 1998 and made a Royal Academician in 1999. Collections include Tate Gallery, London, The British Council, Arts Council of England, FRAC Pays de la Loire, France, and Leeds City Art Gallery among others.